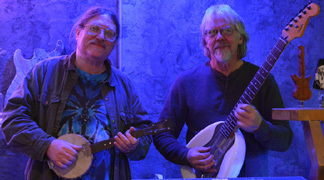 Resisting the digital dark of the laptop set, Art Cohen and Scott Watkins get in touch with the currents of creativity by way of the currents of electricity running through their guitars. 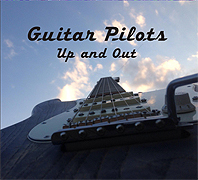 Their duo Guitar Pilots has realized a profound double CD showcasing a unique and singular vision. Up and Out demonstrates that the hand moves faster than the thought, as it celebrates the messy vitality of creative collaboration. Featuring seven tracks across two discs, this work hums with undercurrents and sings a heavy metalized message. Jaw-dropping virtuosity is substituted with mind-warping sounds, as heady-mental crosstalking leads give way to dense metal meditations and a woozy submerged feel. Driving and precise, then dreamy and rhythmic, this real-time performing pair use electric guitars, and the associated processing effects, to design a rich and varied palette of textures and tones - which makes for a constantly renewed sonic interest. Along with the looping riffs, sustaining e-bow leads and studies in glissando guitar, Guitar Pilots also include The Beam; a large amplified stringed instrument - meant for plucking, picking, rubbing and generally producing a range of unearthly sounds and tones. Whether resounding on its own, or joining the ferrous forces of echoing guitars, The Beam adds a distinctive, somewhat sub-sonic attribute to this album. These low notes murmur and vibrate like no known instrument, and often presage more kinetic passages. As riven lead lines spin out their cosmic protest at free-fall velocity, a foundry of melting sounds waits below. Once the atonal mass has hardened into a stronger alloy, the duo lights out to even further atmospheric realms. From a single point of charged spark, to an expanse of ethereal limbo, Up and Out is brilliant in its imaginative scope. It aligns with the values of good Spacemusic - and creates a mental state that runs counter to that of the outside world. Mastery of this kind of music is not found in its physical performance, but rather in its design and spiritual effects. After a good listen to Up and Out, it will be easy to regard Cohen and Watkins as among the most eloquent guitarists this side of the dark side of the moon. From bleeding distortion to clean strummed strings, GP moves us steadily between eerie darkness and the reassuring light, then back again - with their revelation from a dark star, to the third stone from the sun.